In the ever present modern drive for improvement, development and doing things faster, better and cleaner with a myriad of must-have tools which we have accumulated over the years, we often miss that joyful experience of being in the workshop working on a chosen project with hand tools. These rifflers from Auriou are just one style of such tools, and are designed to remove wood quickly and cleanly, and the only power needed to make them work is a movement of the arm. No noise but the hiss of teeth cutting the wood, which is a pleasant experience when we are often surrounded by noise in our lives. Rifflers are not new - they have been around for yonks and these ones, handmade in France, are double-ended, and are available in a variety of shapes, headshapes and lengths. They are designed for wood and have hand-cut teeth. They are finely balanced and fit in the hand well. Different 'grain' grades are available â€“ the higher the grain number the finer the cut. So a 14 grain gives a finer cut than a 10. There are six patterns to choose from and these come in four lengths - the longer the overall length the coarser the grit. I tried them out on a variety of shapes and projects to gauge their mettle. The various head sizes and sweeps allow one to reach in all manner of places with ease. The cut is fast on all of the grain grades used - actually very fast - considering how little elbow grease is actually required to use them. 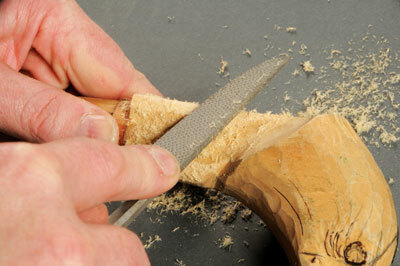 They cut on the push to establish the primary cut, with a gentle cleaning action obtained on the pull cut. There is some debate as to whether they should be used on the push stroke only - to be honest I don't mind either way as the tools work brilliantly. Being steel, spray with a bit of moisture displacing fluid to prevent rusting if you have worked on wet wood. 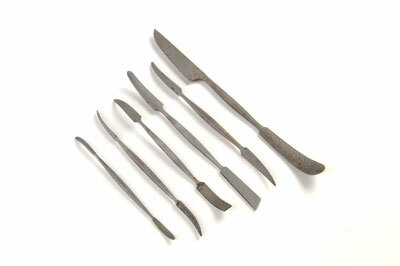 These really are great for cleaning up carved sculptural elements on your turnings, and when working on irregular shaped carved work with lots of odd-shaped cut ins, curves and voids. It takes years of experience to be able to craft such items and it is fair to say that these are not cheap. However, they are beautifully handmade crafted items that will last a lifetime and are a joy to use. If you carve or sculpt your work, they are worth investing in. These tools are very easy to work with. The various shapes allow you to reach into a multitude of places on your turnings. No, they are no cheap, but they do work well and offer a very good solution to what can be a tiresome and tricky problem to solve.